This feature is most important in VBA as it defines the rule to declare a variable or a procedure depending on how to access those members.It is similar to Object Oriented Programming concept. Some times a variable has to be accessed across different subroutines and sometimes, the variables and subroutines has to be confined and restricted access from other members within the program. This is done by assigning appropriate scope to them. As the name implies, a variable or subroutine declared as public is accessible across the entire project, that is, from different functions or subroutines.One example is when a program is working on attendance statement of a single person, here, the person name is stored in a public variable so as to enable all the subroutines to access that variable. str = "I am String Variable 'str'" & vbNewLine & "Am in sub1"
str = "But Now I am in sub2" & vbNewLine & "I am accessible across the Sub" & vbNewLine & "because I am a PUBLIC variable!!" As the name indicates, these are accessible within the sub or function where they are declared. All Variables declared within the sub are local variables and cannot be accessed from any other sub. 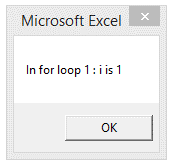 Also, there is a provision in VBA where you can use a named variable in a for loop without declaring it even as local variable. 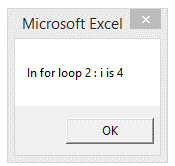 By this, that variable scope is confined within that for loop alone and the same name can be assigned to any other variable. 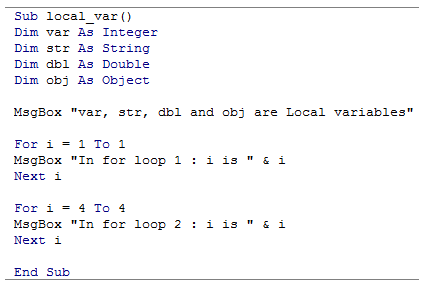 MsgBox "var, str, dbl and obj are Local variables"
Note from the above example that the variable "I" is treated as two different variables in the for loop. 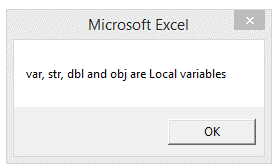 4) How can worksheet functions be accessed in VBA?